Did you guys hear? Nick Foles is starting Week 1. So the man who stunned us all last February will be under center for the Kickoff Game. 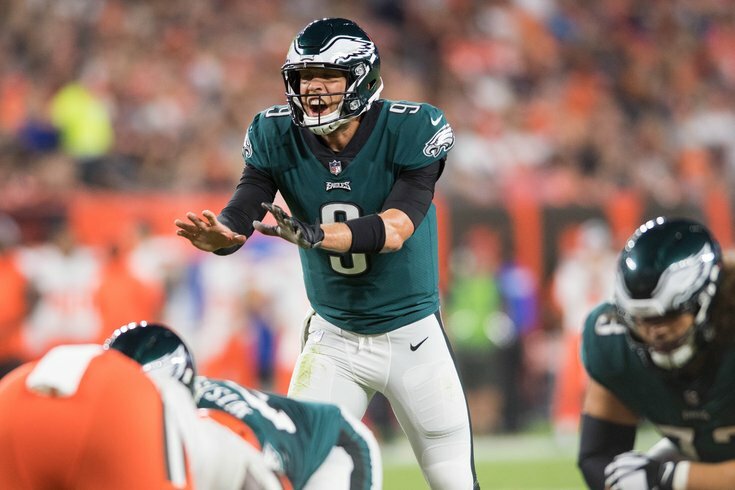 The new/old-car smell on Nick Foles has felt more like what you'd find on an '89 Topaz this preseason, as the QB's play fluttered back to Earth like one of his August tosses. All of which would mean very little if Carson Wentz were ready to go. Alas, he still hasn't been cleared as he makes his way back from a torn ACL. Even so, with all -- er, almost all -- of the starters returning from the team that won Super Bowl LII, no other squad feels more contender-ish than this group. I can poke holes in all of 'em, in fact. #JimmySays: I didn't understand any of that. Nope, Carson Wentz isn't ready. Yup, preseason a mess for Nick Foles and depleted offense. But champs retain our top spot until first L.
#JimmySays: There seems to be a certain tone of waiting for this team to fail, to knock them off the top spot because some other team is better. I don't understand that mindset. The Eagles were clearly the best team in the NFL last year, and not just because they won the Super Bowl. This offseason, they improved their roster, on paper anyway. The roster is full of talent, but there is still some concern about Carson Wentz and his knee. It doesn't look like it will be a problem for the long term, but it's still worrisome. #JimmySays: The Green Bay Packers (???) are No. 1 in CBS' power rankings? Huh? A season ago, the Packers lost their starting quarterback, and they went 3-7 without him. When the Eagles lost their MVP-caliber quarterback, they just went out and won the Super Bowl anyway. That should clue some folks into the difference between players No. 2-53 on the Eagles' roster, and other crappy supporting rosters, like the Packers'. The Eagles were able to soar above the injury bug last season with some supersubs, led by Nick Foles. Doing it again against an even more stacked NFC will be difficult, especially with little clarity on Carson Wentz’s clearance. #JimmySays: The Vikings are ranked second here, despite the Eagles' de-pantsing of them in the NFC Championship Game. #JimmySays: Here's my gentle reminder that Super Bowl hangovers don't exist, for the winner of the Super Bowl anyway. Nick Foles is the pick to start the opener at quarterback after the defending champs spent all of training camp and the preseason wondering if Carson Wentz would be available while watching Foles, the reigning Super Bowl MVP, struggle with nagging injuries and less-than-promising on-field results. No matter. The Eagles are the league’s top team until someone proves otherwise. They have a still-shiny Lombardi Trophy to prove it. And just for the hell of it, I took a look back at some of the power ranking posts from this time last year. They're not as hot takey as I hoped, but it's still fun to look back now knowing how the season played out. It's very possible that the Eagles can be one of the six new playoff teams the league averages every year. Last year, the Giants, Cowboys, Falcons, Lions, Raiders and Dolphins were newbies. Philadelphia should be able to hold its own against those squads. We saw it against Miami in the preseason. What we haven't seen enough of is a new-look first-string offense, which my colleague Brian Baldinger so aptly pointed out. If Carson Wentz takes a big step forward, they will be much higher on this list at season's end. The division is a tough one, which hurts. The Eagles have fortified the offense around their second-year QB, Carson Wentz, and they presumably will have tackle Lane Johnson available all season after he missed much of last season while on suspension. Assuming that Wentz is better, this offense will be better and the team should be better as a whole. But it still might be difficult to leapfrog the Giants and Cowboys in the division. Philadelphia Eagles quarterback Carson Wentz is a baller. He looked good as a rookie last season. He's looked even better through the preseason. Alson Jeffery has been solid at wide receiver, but let's not get too hyped about the new-look Eagles receiving corps. When an aging Torrey Smith is your No. 2 wideout, there's room for improvement. At this stage in his career, he should be a No. 3 at best. Defensively, the Eagles have an impressive front seven. With guys like Fletcher Cox and Vinny Curry, there is a lot of talent on the defensive line. I absolutely love Mychal Kendricks playing linebacker behind it. I do have questions about the secondary. The Eagles have good safeties, but not a ton of cornerback talent. Ronald Darby is serviceable, but he's the only corner capable of playing man-to-man on a consistent basis. That's a problem against Kirk Cousins and the Washington Redskins, who have a ton of receiving threats. Carson Wentz looks like the real deal with his new weapons, and the Eagles defense is legitimately stacked now that some of the secondary issues have been addressed. They are NFC sleepers.